The MDBL Series is a general purpose family of drives for brushless DC (electronically commutated) motors. With either a 115 VAC or 230 VAC line source, our drives can control motors that vary in the 90 to 180 VDC range, up to 5 amps or 1.5 HP. With the use of on-board trim pots, you can quickly set the maximum and minimum speeds, acceleration and deceleration rates, motoring and regening current limits, and the proportional and integral feedback gains. 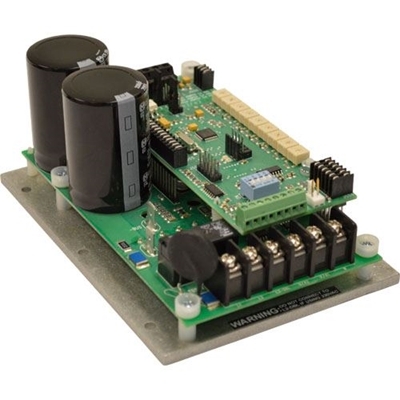 Each drive is designed for feedback from 120° hall effect sensors. The onboard microprocessor allows for custom programming for OEMs. Whether it’s as simple as changing the purpose of a jumper, input, or trim pot, to programming entire routines and behaviors specific only to the OEMs application, the MDBL is great for integrating PLC like functionality into your operation. Doing this can eliminate the need of a separate PLC altogether or enhance a system that currently does not have one. The MDBL Series has been tested to the 61800-5-1 Standard and is UL listed in the US and Canada, and includes isolation for remote control from an analog signal. Doubler mode: Can double a 115 VAC line to a 280 VDC bus output. Diagnostic LEDs: LEDs for power and status (undervoltage, overvoltage, short circuit/current trip, overheating warning/trip). Thermally protected: Drive recognizes when overheated as a result of overload. It first flashes a warning code on the status LED and will eventually trip if the condition persists.